Today Symon and I (along with a group of other Northlanders under 40 years of age) had the privilege of meeting New Zealand's Prime minister, John Key, and a few other ministers of parliament at the beautiful Copthorne Hotel in Waitangi. While being offered platters of delicious canapes and drinks, we listened to various Ministers of Parliament share, including John Key - and it was actually quite interesting. 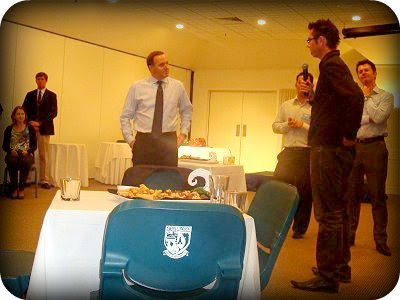 Three people were selected to ask Mr Key a question, and my awesome husband Symon was one those. His question was a great one (and not controversial for once) and it was in regards to family life balance and handling pressure with such a stressful job. I was very impressed with Mr Key's answer, especially hearing that he works on average 16 hour days, 6 days a week (check out his mean body guard to the left). Afterwards we mingled, and I couldn't resist getting a few shots with the rich and famous (if you could consider New Zealand politicians to be famous). 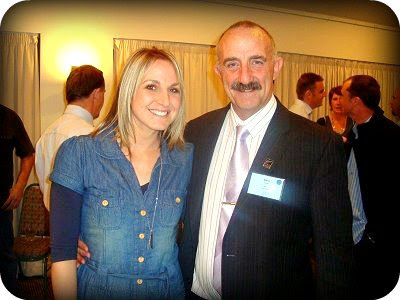 First I chatted with Far North MP, John Carter and casually mentioned that I'd love a photo with the Prime Minister. 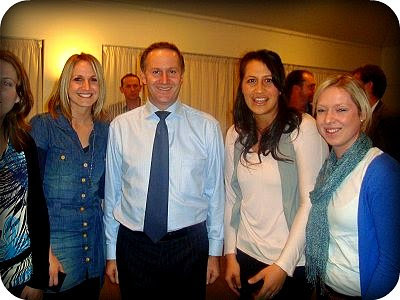 He rather promptly walked me over to the Prime minister, moved a chair and snuck me in next to John Key for a photo. John Key turned to me and said an awkward "hello" and I said a polite and rather awkward "hello" back, before we both turned and smiled for the camera. Classically awkward moment - but very worth it. 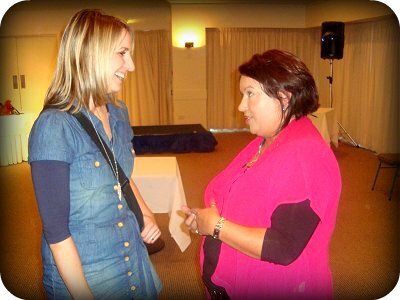 I then moved on to chat with Hon Paula Bennet (Minister of Youth Affairs and Minister for Social Development and Employment) and get some tips on how to get around our anti-smacking law - JUST KIDDING. She actually shared a rather funny joke with me and was really nice. So all in all we had a really great time. Politicians aren't as bad as they seem, and even though we don't agree on everything, today I saw and listened to some people who do actually care about our country and it's people, and want to make a difference. LOL! at your and John Key's awkwardness :) Wow that is impressive about the wage thing!! That must have been mean as! Envious! this is sooo cool!!! i'm in love with politics (gasp! i know, is that really possible?! yes!) 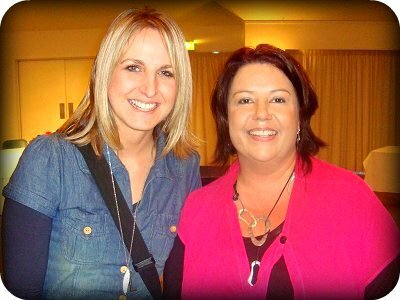 so i would've been ever so starstruck! How cool! I would love to meet Mr. Key! It's not every day that you get an opportunity like that! THANK YOU for posting this! I've been reading you for a couple of weeks now, and have been trying to figure out where you are from. Mystery solved! I thought maybe England (using words like Mum often) but I couldn't quite pinpoint it. :-) I've heard many wonderful things about your country. I truly would like to visit someday. That is too cool. And I'm lovin' your denim outfit! oo interested in your "cafe" seeya soon. Awesome! I hate that everybody bags on the leaders of our country as soon as they get into power. I say, give them a chance. I like that they really care; they might not make decisions all the time that I would choose, but if they really CARE that goes a long way for me. I would LOVE to meet John Key. Way cool for you and Sy!